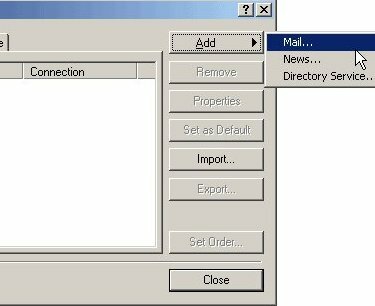 These instructions will walk you through how to setup your Outlook Express 6 mail program. 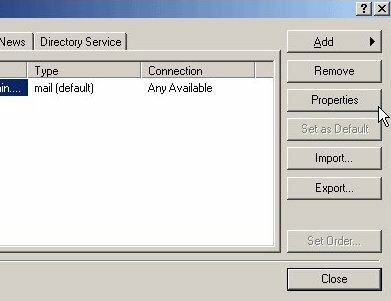 If a setup wizard loads cancel the wizard and follow the instructions here. After the wizard is gone, choose "Accounts" from the "Tools" menu at the top of the window. The next window that pops up will be "Internet Accounts". Click the "Add" button to the right and choose "Mail..." from the popup menu. 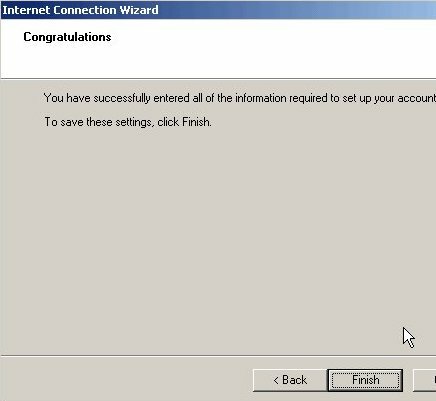 A window will load called "Internet Connection Wizard". Simply enter your name in the "Display Name" box. This is the name people will see when they receive an email from you. You can use your own name, a favorite nickname or even a department or company name. After entering the name, click the "Next" button. Now select "I already have an e-mail address..." & type in your Pacific Online email address. Now press the "Next" button. 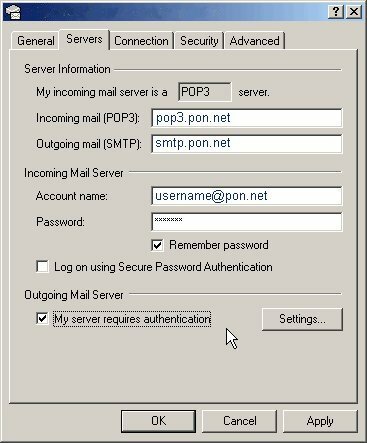 In the next window be sure the "My incoming mail server is a" "POP3". 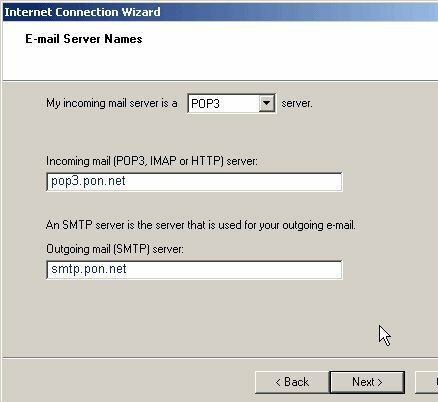 The second box, "Incoming Mail", needs to read: pop3.pon.net The "Outgoing Mail" box setting needs to read: smtp.pon.net. 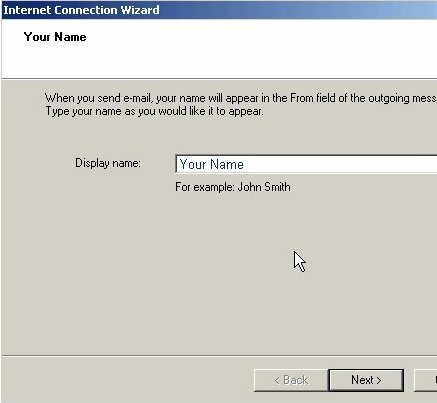 After entering the mail server names, click the "Next" button. 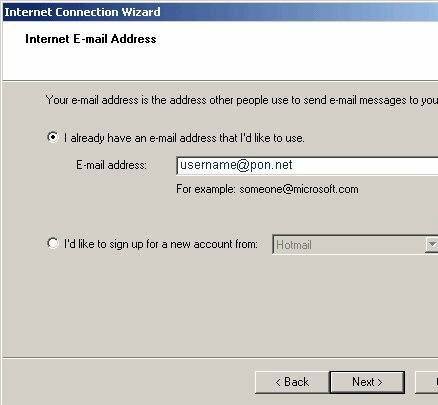 In the "Account Name" box enter the first part of your Pacific Online email address, without the @pon.net. 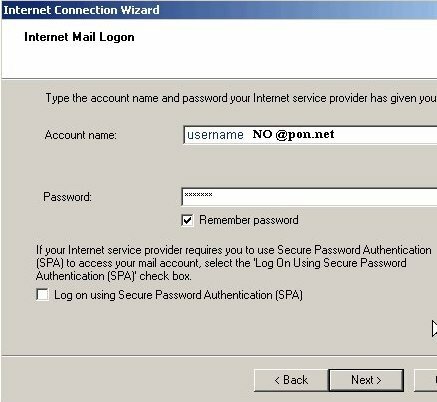 Enter the password that you chose for your email account. Next, place a check mark in the "Remember password" box. Authentication" box. Lastly, click the "Next" button. Click on "Finish" on this screen. You will now be back at the "Internet Accounts" window. You will now need to click on your "account" to highlight it blue. This will be the line of text in the white box. Once you have highlighted this blue, click the "Properties" button on the right side of the window. Under the "General" tab in this screen update the Name, Organization, Email Address and Reply Address. Be sure to check the box for "Include this account when receiving mail". Once this information has been entered click on the "Servers" tab. Near the bottom of the "Servers" box, check the box that says "My server requires authentication". 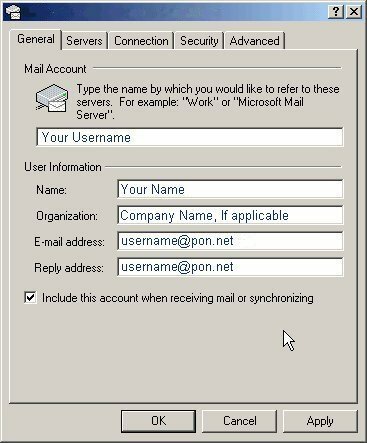 This is an important setting because it prevents unauthorized users from sending email out using your email account. If you forget to check this box, you will be able to receive email, but not send email. Once you have checked this box, click on the "Settings" button in the bottom right hand corner. 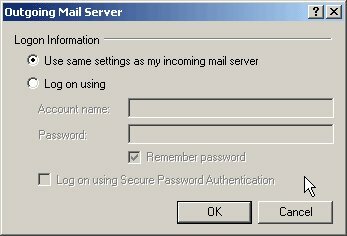 In the "Outgoing Mail Server" window that pops up, be sure that the "Use same settings as my incoming mail server" is checked. Finally click "OK" which will close this window. You are finished with setting up your email account in its entirety. 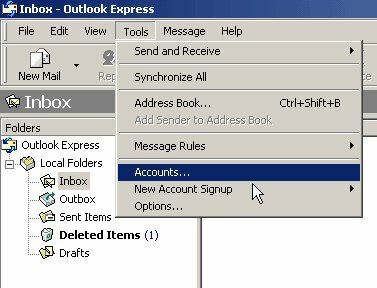 Lastly close any windows that are open - but leave Outlook Express open. Click on the Create Mail tab and try sending an email.